Sync is very useful when you are importing or modifying files directly on the file system, e.g. with FTP. It basically compares the File Info (file size, modification time and MD5 checksum) stored in the database with the actual files. New files will be added automatically, including ID3 tag detection and thumbnail generation. For files in sub-directories Sync creates the Category tree, i.e. for “folder1/subfolder/file.pdf” it creates the category named “subfolder” and it’s parent category “folder1”. At first the plugin checks for changed or deleted files. In normal sync operation it just compares sizes and modification dates to detect a file changed. In hash sync it compares the MD5 hashes, which is more reliable, but can take much more time. When a file change is detected, it updates the values in the database including extended file info (ID3 tags). New files are added to the database. When adding new files with sync WP-Filebase looks for an image in the same directory with the same basename to use it as thumbnails. Example: document.pdf and document.png. Images named folder.png are used for category icons. 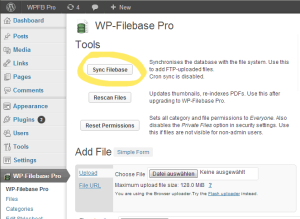 Remote Syncs are executed (WP-Filebase Pro only). See Remote Syncs. You can simple add thumbnails to your files by uploading an image with the same name as the file. For example mypdf.jpg will be used as thumbnail for mypdf.pdf. Also images with names like document-80×120.jpg are use as thumbnails. Any images named ‘folder.jpg’, ‘folder.png’, ‘folder.gif’, ‘cover.jpg’, ‘_caticon.jpg’, ‘_caticon.png’ or ‘_caticon.gif’ will be treated as category icon. If not something went wrong. In most cases its PHP running out of memory, especially when adding a great amount of files. To reduce memory usage, disable ID3 detection (WP-Filebase -> Settings -> Misc). If you still have problems, append &debug=1 to the URL of the sync page, for example: //wpfilebase.com/wp-admin/admin.php?page=wpfilebase_manage&action=sync&debug=1 . The plugin will output backtrace debug info in HTML comments. Right click on the page, view source and scroll to the end of the document to see the last backtrace info. Copy this text and include it in a support request to get help. WP-Filebase Pro has a batch sync mechanism to partition the files to add. The sync is executed with multiple HTTP requests so the overall memory usage is reduced. That allows to sync an unlimited number of files at once. The normal sync would run out of memory after about 1000 files (with ID3 tag detection enabled and depending on server’s operating system and configuration). Batch Sync detects if the memory usage is critically and starts a new request if needed. Hi there! I have a question… on one site where I’m testing WP-Filebase, to see if it meets my requirements, I had already uploaded all the files — around 126 GBytes or so. But there are not really many files, just 44 in total, each of them being huge (mostly they’re videos made from workshops). The problem here is that I don’t get any progress from the “sync” feature. Checking for file changes… done! 44 Files found, 36 new. and a bar saying 0% complete. It stays that way for hours. Nevertheless, it has worked for a while: after all, it did manage to find 8 files, tagged them correctly and so forth, and everything works well on the page where the tree view is placed with a shortcode, etc. So I know that the setup (permissions, etc.) is fine. Some of the files that were found on the first run are a couple of GBytes long, so WP-Filebase seems not to have any trouble with huge files (even if there are much bigger ones). My problem is that I get no feedback for the remaining 36 files, and no clue if WP-Filebase is actually doing anything or not. Short of directly hacking the database to “reveal” those files — something which I’m not familiar with and would definitely avoid at all if possible — is there anything else I can do to actually “see” if WP-Filebase is doing something or not? Note that this is for an educational site where students who have missed a workshop or two are able to access a password-protected area where they have access to notes and I wish to give them access to whole videos or audio transcripts. After several refreshes, testing at different times of the day, I managed, so far, to reach 8% 🙂 — I turned ID3 detection off, to see if that improved things, and separated all files according to different folders/categories (to see if that helped). I think that now it’s just a question of being lucky until I get the whole process to complete at least once. It would be nice to get a bit more feedback on what’s failing, though. Some further feedback. To populate the database, apparently WP-Filebase calls md5sum externally. Now when this is invoked for huge files (several GBytes), it seems to fail with a “broken pipe” error, which is understandable. My hosting provider limits the amount of memory a script can consume, and it’s perfectly reasonable to expect that an application needing GBytes and GBytes of data will be killed sooner or later. While it’s reasonable to assume that MD5 checksums are useful for people to confirm that they have indeed downloaded the correct file (and that it has no errors), would it be possible to change the Sync functionality so that it’s a two-step process — the first time it runs, it just fills all the required fields on the database (so at least everything gets properly registered on the database), and on the second step it does the MD5 checksums and all other steps that require huge amounts of memory or of processing time? Ideally, of course, one should have some options to refresh/sync individual files. All right, I can confirm that the main issue is not with the plugin by itself, but with the amount of running time for md5sum. For files with over a few GBytes it takes so long that the pipe connection between the PHP process and the md5sum process times out, and obviously Sync will fail. A temporary hack is just to edit classes/Admin.php and comment the contents of GetFileHash() by returning something fake. This allowed me to import all files in a few seconds (11 seconds, to be more precise). Obviously it means that the file hash is now useless. My next step is to go through the whole database and manually add the file hashes. The issue with the timeouts and having the exec call hang Apache/PHP is a tricky one. From what I’ve gathered, a (possible) solution would be to use proc-open() or the more simple popen() calls instead. These allow processes to be spawned asynchronously and not have PHP wait for them. Of course this requires a big change on the code! Essentially, there would be a loop gathering all filenames and relevant data, and a batch of asynchronous processes to be launched for each one (it’s not a good idea to launch hundreds of them at the same time, of course! ), which would update the database as soon as the hashes are known. So, in theory at least, the whole database would be quickly populated with the filenames in a few seconds, while the hash processing might take hours or days, but eventually it would finish. Changing the code for implementing that asynchronous behaviour is utterly beyond me, I’m sorry. good aspects you pointed out. Making the sync implementation asynchronous, would be a quite efficient and advanced approach. Like you said, it is a tough coding challenge though, since PHP is not designed for asynchronous tasks, much workarrounds would be needed. I think splitting the sync into 2 task is the best solution: first populate the database with file names, then run a cron-like task in the background that calculates md5 and reads ID3 data from files synchronously. I’ve put this on the todo list, however I’m quite busy with other features, like bulk upload/edit, so it might take some weeks until I can give it a try. Thanks, Fabian 🙂 That’s all right, as said, right now, my workaround works well enough for me: just edit GetFileHash() to return something fake, and add the MD5 sum manually, processing it on the console. It definitely works for me. But this is a bit tricky in terms of security, since fake hashes might be uploaded, or something like that, and it’s better to let the server calculate them after the file is fully received. next to the sync button there’s a URL for external cron service. You’ll find cronjob services at google. im sorry, but I don’t see any URL for external cron service… We are thinking of purchasing the PRO version, but this would be something important for our decision. I purchased the Pro version… Is it possible to have the files sync without having to manually push the “Sync Filebase” in the admin area? I have added files via the FTP and manually synced the the files display. However my client needs to to be able to add files to the FTP and it automatically without the “Sync Filebase” having to be manually done. The WFP admin is saying “Last cron sync on October 3, 2013 at 2:49 pm.” but a file that I added yesterday is not showing up on the clients website. Please help! I am having problems searching pdfs. I am using the Pro version and trying to search on pdfs. There are over 400 documents on my site, almost all are pdfs. I have Ghostscript 9.10 installed and have run the rescan more than once. But my search results using your search widget do not generate hits on the pdfs. It only searchs the manually entered metadata. Some of the pdfs are simple scans of hardcopy documents so I do not expect to search in those but others are pdfs that can be searched using any pdf viewer. Below the form wehn editing a file, you’ll find the “File Info Tags” box. There you can what keywords are used for search. These keywords are automatically searched with the widget, no special configuration required. Thanks for the information. Using that I was able to determine that the widget is correctly searching the keywords. The problem seems to be that ghostscript is not generating keywords for every pdf. Some of them have text that can be selected in a viewer so the keyword should be extractable, but ghostscript isn’t extracting it. I am still looking into that but I’m not sure what to do if it is a limitation of ghostscript. Is it possible to include a file (txt?) on FTP uploads that will contain file information for other items such as image files? 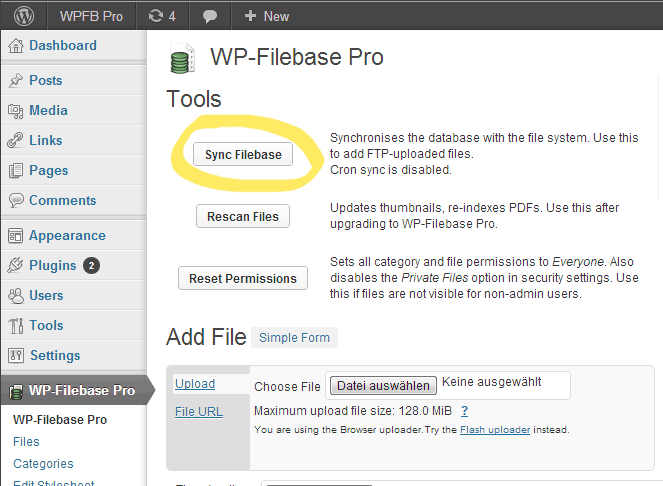 Can someone please tell me how to enable the “Batch Sync” feature of WP-Filebase Pro? One of my site instance cant sync the files for some reason. I tried everything written here.